Is It a Plant or a Weed? A heatwave hit this week which really put a stop to our gardening plans. It was just too hot - even to have the children under the shade...but we are hoping that as the temperatures are now cooling off a bit that tomorrow we will be continuing with the chook shed transformation! 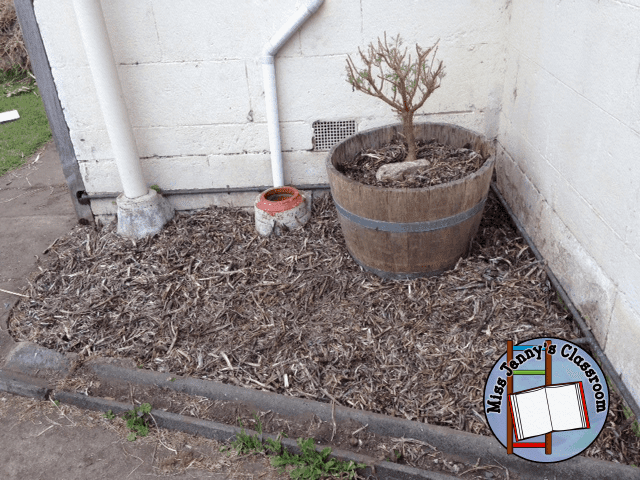 This post though is going to be about another focus I have with my children: plants vs weeds. They both know what trees and bushes are....but working out plants vs weeds got a little tricky. Why? Read on! It comes down to a problem of description. I can't tell them that green is a plant...because so are the weeds. I can't tell them that plants grow up...because some are groundcovers and let's be honest - I have a few weeds going bonkers growing up, out and everywhere. In the end it became more about identifying specific weeds and plants so they knew what to pull and what to *hopefully* leave in the ground and they did well. I should have taken before images (but was rather embarrassed by the overgrown nature of my garden - several years full time teaching and then full time with the children...well, I only have so many hours in a day!). It was a lot to do and admittedly the back verandah area still isn't finished...but more on that below. I wasn't actually sure what I wanted to do with this area. I had thought the pond was quite shallow and so while I got digging the kids were allowed to pull up all the weeds....as that was all that was growing in there. I was surprised to find that the pond was considerably deeper than first thought and that we didn't find any evidence of the sand that had been used to fill it up. After the kids pulling up the weeds, me turning over the dirt and the kids raking the soil (got to love the kid garden sets....will post about them next time) we decided that the former pond could stay. The decision for it to say is not without a bit more work. The fence that surrounds it is study at the end closest to the front but the back section is attached to a rotting wooden post that will need to be dug up and replaced at a later date. The kids got their bucket and dump truck and started moving the bean straw I wrote about last time (we are currently about half way through the bale) and spreading it onto the dirt. 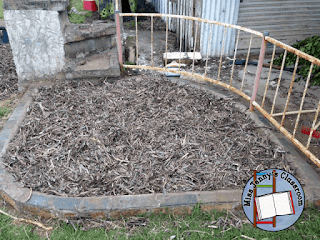 The goal was originally to leave the mulch there for a month or so before planting anything. The problem is though that while it was deeper than I thought I still worry about the drainage factor. We are considering repurposing a couple of old half wine barrels that are sitting around not being used and making the former pond area into a strawberry patch. Stay tuned. This was the easiest section by far that we've tackled. The kids already can identify a daisy bush though it looked a sorry sight to begin with). I got the secateurs and went...as my kids' say...Chop- Chop with the bush. Originally I was going to leave about double what is pictured but had to remove the back section as it was starting to rot on one side. Of course when the back section was removed the bush fell over. My kids came to the rescue by moving some small stones that we had sitting on a path that we had found while digging in the garden and we used them to prop up the daisy bush. I think we all thought it looked much better afterwards. The agapanthus likewise got a Chop-Chop and my son helped me pull out some of the plants that were too close to the shed. They were awful to try and dig out due to the limited room but we got there and he was so excited to move the last of the bulbs and find he could run around the bulbs - which is what he and his sister proceeded to do for the next 10 minutes. There is a little bit more to the right where a fern was dug up, separated, we replanted two small sections (and my brother took the rest back to his place). It was then back to moving loads of the mulch. At this point the kids also went and got their mini-watering cans and proceeded to wet down the mulch. They have that knowledge now that as soon as the mulch is down - the water is needed - fantastic learning going on here! Once cleared we moved the mulch and watered it in. As you can see from the photo this section involved downpipes...and pipes under ground...and I don't want to be responsible for cracking or breaking any pipes! Unable to plant directly in the ground my son helped me to roll a wine barrel over. The kids then helped to decide where we should put it and then we filled it up about half way with dirt from the garden (I should note that this barrel has holes drilled into the base to allow drainage - if you don't do this your barrel will likely become a pond). 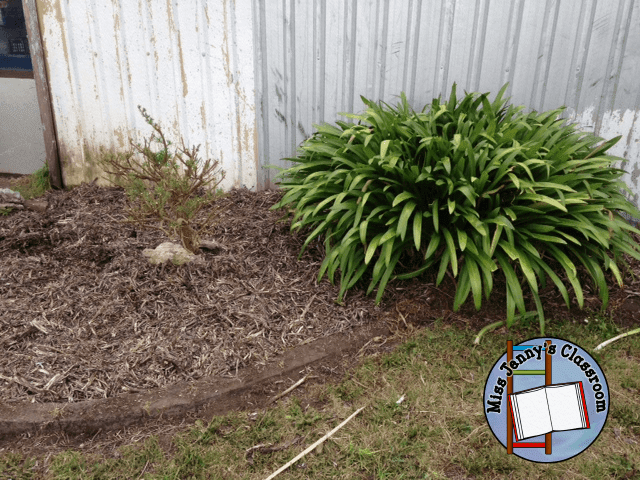 With this daisy bush out of the ground my kids and I took a break under the verandah to look at the parts of a plant after it had gotten a Chop-Chop. We focused on leaf/leaves, branch, and roots - the the basics to begin with. This bush wasn't flowering at the time but the kids already know what flowers are anyway. My daughter then assisted in lifting the daisy bush (this one was dug out from another part of the yard where it was growing against a path) into the barrel and moving the dirt around it. A layer of mulch and watering following. A rock was placed inside to keep the daisy bush upright while the roots took hold. This section needs something more...but we were too tired to think about what else to add that day! Overall, it was a very busy day with lots of hard work. The kids were in bed at 5 p.m. and I didn't hear from them until 6.30 a.m. - go to love that! Working in the garden does present many opportunities for age-appropriate learning, interaction with yourself and the environment, and vocabulary development for children of any age.